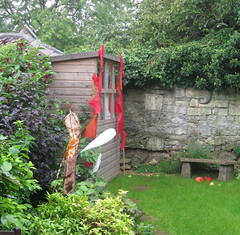 This is my beautiful workshop at the end of the garden. It's under an old apple tree (you can see some windfalls in this pic) and I am very happy when I'm working here. The prayer flags were made by my boys.